Jay S. Willis is a graduate of Capital University, having earned a Bachelor of Arts in History and Political Science and a law degree there. Jay’s History studies focused on Medieval Europe and he completed independent study research projects in the History of European Medieval Magic and The Spanish Inquisition. Jay combines his education into both the practice of law as an assistant prosecutor, as well as a fantasy fiction writer. Jay S. Willis is presently working on revisions to the first two books in his Sphere Saga and has begun querying agents for his recently completed middle grade fantasy Pendulum Arcanum. You should check out his website, or catch him on Facebook, or Twitter. Often authors and readers of modern fiction alike believe our modern concepts of magic and mages stems only from Tolkien and the King Arthur legends. In fact, a study of scholarship from ancient Rome, the Medieval, and Renaissance periods reveals modern wizards in fiction are firmly rooted in much older real world works and treatises. The history of magic in the real world spans far back beyond even Merlin and Gandalf. Writers of Fantasy interested in magic would be well served to look to the works and thought of a collection of real world Medieval and Renaissance “mages” for inspiration. Several great scientific minds originated real-world concepts of magic based in science, medicine, and philosophy. 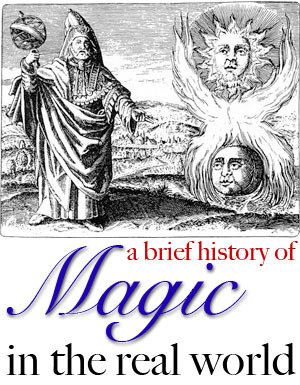 The history of magic in the Medieval and Renaissance periods stems from ancient times, originating primarily from the works of four prominent authors in Roman times: Seneca, Ptolemy, Pliny, and Galen. These thinkers provided a firm foundation for “magic thought” that further developed in the Middle Ages and into the Renaissance. The most dominant ancient magic themes tended to revolve around divination, dream magic, astrology, and natural magic. Sound familiar? Modern fiction, television, film, comic books, and video games are all variations upon these ancient concepts. Seneca, an ancient philosopher often cited in the Middle Ages, focused his views on magic around divination and astrology. Seneca viewed the stars as being divine and considered their study as sacred and almost religious. Although he firmly believed in the impact the stars had on future events, his major focus was the divination of the future by thunderbolts of all things. The works of Ptolemy mostly concerned math, science, astrology, and astronomy. His most important contributions were in the fields of math and science. However, he compiled a great deal of information on astrology and astronomy, considering it a very valid science, and placing much more emphasis on the stars than Seneca. 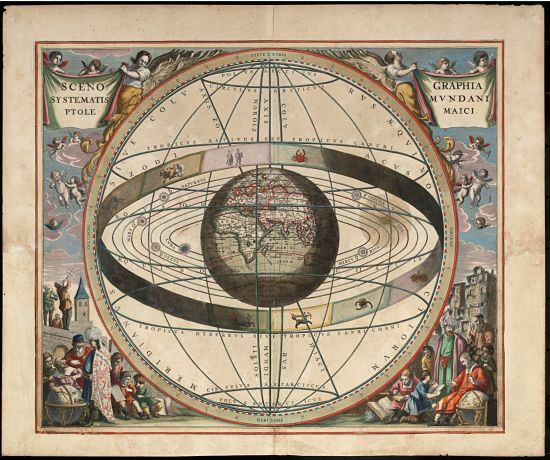 Scenography of the Ptolemaic Cosmography by Loon, J. van (Johannes), ca. 1611–1686. In Ptolemy’s study of astrology, he believed that each planet, all of which affect the entire world, are affected by four basic elemental qualities; heat, cold, dryness, and moisture. Ptolemy said that each of these qualities are either good or evil, with heat, and dryness being good, and cold and moisture being evil. Note Ptolemy’s elemental ideas don’t correspond directly with Earth, Air, Fire, and Water, but there are similarities, and in ancient times there was also a focus on tying each element to a moral judgment. Pliny’s Natural Magic is an ancient encyclopedia covering many topics including magic and astrology. His overall attitudes toward magic are rather complicated to determine because his writings were more or less moral judgments on the times he lived in. However, in mentioning magic, Pliny relates it to the study of medicine and considers magicians to have taken medicine the farthest and into the most detail. Pliny felt that astrology and magic were closely related and he briefly mentioned divination by thunder. Unlike Ptolemy, most of his criticisms on magic tend to be based on an intellectual basis more than on morals. The works of Galen, probably the most prominent physician in Roman times, often misunderstood, misinterpreted, and neglected, concentrated mostly on medicine and he felt that there were no real seekers of the truth left in the world. However, he also included his views on magic in his writings. Galen agreed with Ptolemy’s theory on the four elements and believed to some extent in divination. Galen’s views included very little on astrology. He was accused of practicing magic in his medical practice, though he denied such accusations. The most important ideas about magic used by the Renaissance Magus came from the Hermetic Tradition of magic. 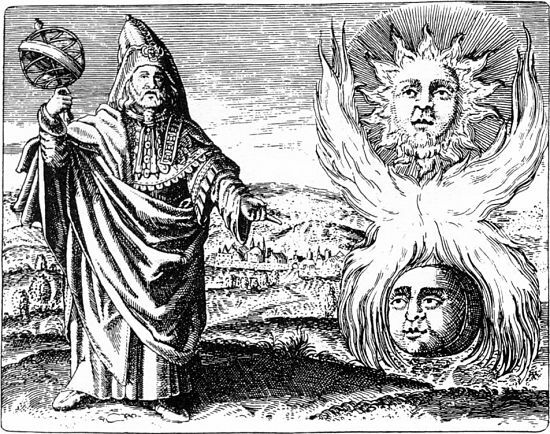 Works by Hermes Trismegistus concerning magic centered on astrology and the occult sciences. Hermetic magic revolved around the idea of a system of the All, with everything in the universe in relationship. With the proper knowledge, of plants, stones, metals, animals, and images relating to the planets and God, one could create a link with this system by means of sympathetic magic. The Hermetic magic was mostly of a talismanic sort, creating talismans in order to link into the power of the All. The Picatrix, based on Hermetic tradition, was a work on sympathetic and astral magic. It went along with the Hermetic ideas of making and using talismans to bring spiritus from the heavens into the materia of the talisman, thus harnessing its power. Perhaps the best synthesis of magic in the Middle Ages and Renaissance was exhibited by Giovanni Pico Della Mirandola. In his works, Mirandola not only originated the romantic concept of a soulmate, he gave The Renaissance Magus the magic of Cabala, synthesized from the Jewish Mystical Kabbalah practices. European Cabalist magic was a spiritual attempt to tap into the higher spiritual powers, placing great importance on angels and divine spirits. Cabala was at its core a concept of gaining knowledge of God. The magic derived from it was to be used mystically to aid in contemplation, or to make use of the power of Hebrew, or the angels invoked to perform feats of magic. Mirandola felt that no magic could be effective without using Cabala to complement and strengthen it. Mirandola created a successful marriage between Hermeticism and Cabala. This synergy in concepts ties in quite nicely for the modern fantasy fiction writer seeking to build their own system of magic. The major similarities in magical beliefs from ancient times to the Renaissance were the beliefs in divination, especially by thunder, dream magic, astrology, and Natural Magic, which came from the Hermetic tradition. Clearly the forces of nature and the heavens played in the magical beliefs of all. Whether those of antiquity and the Middle Ages actually had the knowledge and abilities to accomplish the feats they spoke of is irrelevant. Those of us building worlds and forging new imaginative systems of magic serving as the engines of our fiction can learn a lot by gazing into the minds of the great magic innovators of antiquity. Even a cursory review of the ideas of Galen, Ptolemy, Seneca, and Pico Della Mirandola offers a better understanding of the history of magic created by real world thinkers and scientists. The idea of placing strictures on magic derives from ancient real world beliefs. Sympathetic magic, binding magical powers into talismans, and detailed rules all harken back to the conceptions of magic developed in Medieval and Renaissance Europe. From Gandalf and Merlin, to Harry Potter, and The Force, all our most treasured magic in modern fiction can trace roots to the scientists and “magicians” from the Medieval and Renaissance periods. A bountiful harvest of rich conflicts and plot points abound for modern authors if we are willing to dig around in the past.